Which is more than I thought, but I think that's all of them. There was also a GITD TWD 3-pack of Michonne and her pet zombies. oooh I love this thread! i feel you on this. but for some reason i just love glow in the dark! How is the glow on Holo Yoda? or shall i say...how is the Glow-da? FunkoNinja wrote: I saw a review on YouTube about the new HT exclusive Pumpkin King Jack and apparently, it is a bad glower. Hope it was just a bad Pop! and maybe another reviewer might have a better experience. pop_jumper gave it a thumb's up but I suspect by looking at the photos that it has glow paint on it and is not molded in glow vinyl, and pretty much all my Pops with glow paint on them don't glow nearly as well as the ones with glow vinyl. Thank you, and yes I love that idea! I added your color comments to the list. I'll have to depend on y'all for color info because I'm colorblind! Greens and purples are particularly difficult for me. I added your other info to the list, but can you let me know if you think Hulk belongs on the "good" or "bad" list and I'll add him? Are you talking about on the regular versions of the Pop's? Interesting. Sir Real wrote: There was also a GITD TWD 3-pack of Michonne and her pet zombies. I have those, Michonne is spattered with "mud" and the two zombies are spattered with GITD paint. The spatters are really tiny though, when I looked at them I doubted they would show up at all. I'll have to put them under the black light and see. xmaldigolax wrote: How is the glow on Holo Yoda? or shall i say...how is the Glow-da? No one has reported yet on that one. I have one on the way from Popcultcha so if someone else doesn't get to it first I will as soon as it arrives. Can anyone comment on the Uglydoll GITD Pops? I'm guessing they're painted and therefore probably poor glowers. One of them is black and I just can't imagine a black Pop glowing worth a darn, but you never know. treswright wrote: I added your other info to the list, but can you let me know if you think Hulk belongs on the "good" or "bad" list and I'll add him? Both the full sized and pocket Hulks have a nice, soft, green glow. I'd say it's a good glow overall. If I can remember correctly, the body and face glow, but I don't think the hair does. Here are some more I took yesterday. Again, under blacklight for a few seconds and taken with an iphone. I need a better camera. Wrong, it is indeed molded from a glowy vinyl! It's a shame Slimer doesn't glow better. He glows in the movie for goodness sake! 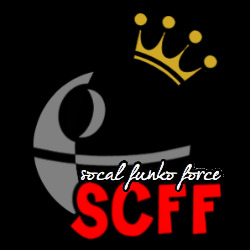 Last edited by pop_jumper on Sat Aug 29, 2015 3:17 am, edited 1 time in total. Got my Creature yesterday and this guy is awesome! Pumpkin Jack's glow is perfect! Itsabecka- where did you find the Cheshire mini? My gf will want that one! Js- right there with you, a purple glow would have looked awesome with the other colors! Rob, congrats! Creature is still my favorite glow Pop and one of my favorite Pops overall too! Alex asked about Spirit Yoda earlier, I finally got my Popcultcha order with him and the Emperor, I quickly tossed Yoda in the case and took a pic before I left. His glow looks about the same as Catbug, not as bright as the others but still pretty good and a nice color. Tonight I'll charge them up and shut off the light and take a comparison photo. Is Vader the same vinyl as the Emperor? Here's the promised light on versus light off comparison. I'm disappointed in Pumpkin Jack, he has no glow under black light. When it's turned off he does glow but it's very faint. I think on his own he'd look ok, but he's too anemic when surrounded by the others. That aside he is a very cool Pop! Great detail and looks really interesting. Also the photos don't show it well, but Adipose's hands and feet are blue under black light (body is green) but glow green the same as his body with the light off. Same with Vault Boy, he has a green head and blueish body under black light but all green with light off. Thanks for the info! I thought it was a new release, they've come out with some cool minis lately like the gitd Jack/ Sally/ Oogie set! This is going to be my how-to post on the bat case, I'm going to upload the pics from my phone first and then switch to my laptop to type the info. The case is a baseball bat display case from Michael's. It is totally painted in black and has a velvety lining in the back. The door is hinged and held closed by several magnets. It's a nice, sturdy, attractive case. I bought two during a BOGOF sale. One is in my bedroom per the earlier photos. The bat supports in the case are inserts that just slide out. There's a cup for a baseball at one end, I just pulled it out by hand and cleaned off the glue residue it left behind. This is a picture of the plastic trim I used for the led strips. It's some kind of window trim I got at Home Depot, it was in the lumber section. It's in 6' lengths. This is the info for the LED strip. Cheaper ones can be found on eBay and Amazon, but sometimes they are just purple led's and not uv even though they may be advertised as uv. This company on the other hand is very reputable, so even though the strips cost more they are bright and definitely uv. The led strips can be cut to length. There is a cut mark shown every 3rd led. To fit the case I had to cut 3 led's off. I then removed the adhesive backing and stuck the strip to the trim. You could just stick the strips directly to the bottom of the case, but this tilts the led's in a bit so they shine on the Pops better and also so you don't get blinded by them when looking into the case. I then attached the trim to the case using 3 small dabs of hot glue- one in the middle and one at each end. I drilled a hole at the back of the case to route the wiring out. The wiring is white, so I installed black shrink wrap on it to help hide it in the case. Connect your transformer and you're done. Here is the case in its new home in the hobby room where my gf is keeping her Pop collection. We have the two display cases connected to a remote controlled switch (you can get them at Walmart, Lowes or HD) so that the lights can be turned on and off from a remote. Added Emperor Palpetine and Dr. Manhattan to the case. Both glow well, not super bright but a nice soft glow similar to Yoda and Catbug (I think the Emperor is the exact same vinyl as Yoda). Finally got around to checking out the glow on my Freddy Bank. For an older piece it still has a great glow to it. Thanks Neu_Funko, I appreciate it! Clash, that's a cool one! 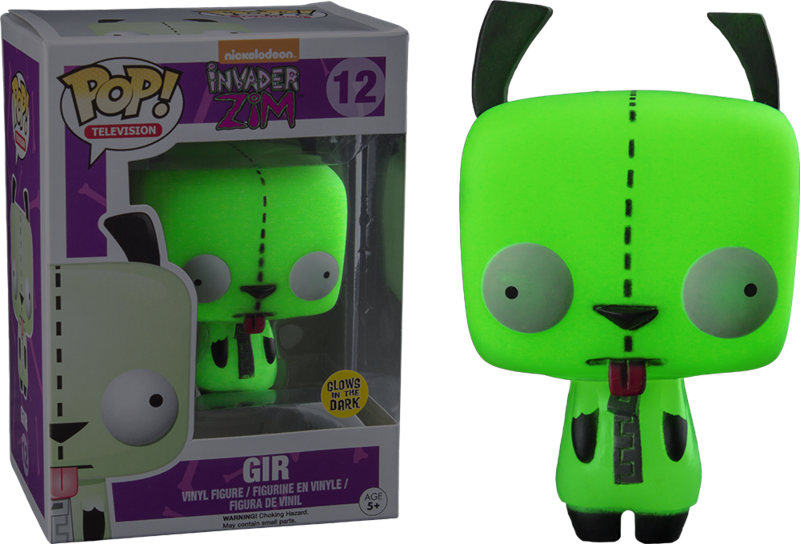 So in the "new glowy news" department, there's a GITD Gir that's starting to show up in Hot Topics on the west coast! It's also up on Popcultcha. Looks like it's molded in GITD plastic so it should be a good glower! Is GITD Stay Puft considered bad? I have one and he glows very brightly. Does anybody have Lo Pan? He looks like he would glow blue, but I can never be sure. Tmwnn wrote: Does anybody have Lo Pan? He looks like he would glow blue, but I can never be sure. You know I don't see too many people posting that one. I had it on pre-order on EE but ended up cancelling it and just haven't got around to getting that one. I still want it, I love Big Trouble in Little China, but haven't bought any of the pops yet. I wonder how he good he glows.... they should have called that one gLOw Pan. BlueberryWaffles wrote: Is GITD Stay Puft considered bad? I have one and he glows very brightly. Well it's really personal perception, I was disappointed with mine (the white version) but someone else may love it. Mine doesn't glow at all under black light, it just looks like it has a purple light shining on it. When the light is off it does glow, but not as brightly as the others. I think it's because it's painted rather than molded in GITD vinyl. All the ones I have that are painted GITD don't shine as well and the glow looks "splotchy'. The ones that are molded in GITD really fire up under black light and have a nice, even glow with the light off. Based on comments I've read it sounds like the pink marshmallow dude glows a lot better. I don't have one unfortunately. I preordered one AGES ago, it keeps getting delayed! If it weren't going to be a gift for my boyfriend, an in-boxer, I'd just say hang the sticker and order it from Popcultcha. It's slated for December now. If it ever arrives I'll definitely let you guys know. Added Princess Bubblegum to the collection. Just her hair glows, but there's a lot of it and it glows so bright that it lights the rest of her. I've got the Glow Lo Pan. He's a nice figure. He has a blue glow -- face and hands. treswright wrote: Added Princess Bubblegum to the collection. Just her hair glows, but there's a lot of it and it glows so bright that it lights the rest of her. You've inspired me to build my own blacklight box now. Is it just me, or does Princess Bubblegum's hair glow yellow? Sharonapple2 wrote: I've got the Glow Lo Pan. He's a nice figure. He has a blue glow -- face and hands. Picked up the Hot Topic exclusive Pumpkin King today and mine glows pretty well being charged only for a few seconds under a light bulb. 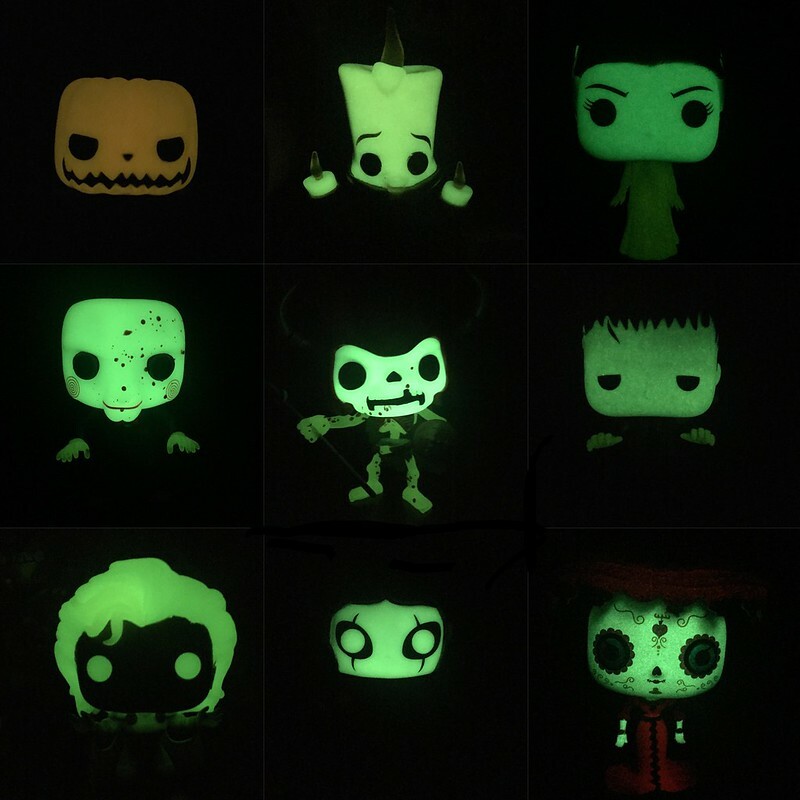 Still for me, the worst glowing Pop is hands down the Hot Topic exclusive Frankenstein. I need a blacklight so I can take some glowy pics too!! 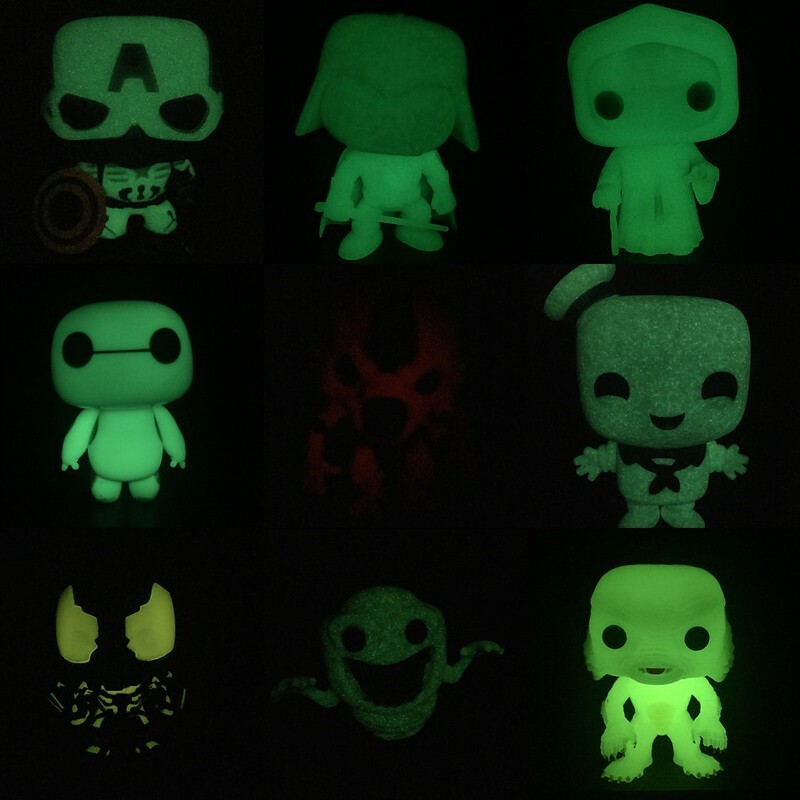 Is there a way to determine in box if a GITD POP is just painted with reactive materials or if it is molded in GITD plastic?